Generally on and around mid to deep reef structures and foul ground. Reefs of good current flow will often have the best results. The most popular rig is the two hook dropper or ledger rig with size 6/0 circle (mustad demon) hooks and a reasonably heavy sinker attached to the bottom. It pays to attach a break away leader to the sinker (lighter than the main trace line) – this will save losing all your gear if fouling up in the bottom or being reefed by a larger fish. As hapuka or groper tend to inhabit similar areas you need to be prepared if you hook one of those as a by-catch! Fishing with braid is a must now; it allows you to feel the bite in the much deeper water (sometimes 200m plus). Even though you do not strike the fish (as the preferred rigs are generally made using circle hooks), it does allow you to keep in good contact with your bait. Flasher rigs are also a very popular method of rigs, but beware of the size leader used as these are tough fitting fish and can reef you if you are not on your game. Small fresh strip baits of squid or skip jack are perfect. Just thread onto the hook several times with a tail hanging off as the enticer. 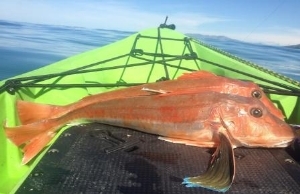 Trumpeter is school fish but can be very soft on the bite. Once they’re into a feeding frenzy the bin can be filled very quickly. The fish can range in size from small 10-15lb specimens common to larger 30 pound trophy sized fish.